Caribeean Larimar Gemstone .925 Sterling Silver Belt Earring 2"
Russian Amazonite 925 sterling silver Earring 1.50"
Main Stone : Amazonite. All our jewelry is 100% natural conflict free. Occasion : Special Occasion. Russian Amazonite, Chrome Diopside 925 sterling silver Earring 1.58"
We assure you we will try to resolve any issues or concerns that you have. Oval Shape Larimar Gemstone .925 Sterling Silver Belt Earring 1.8"
925 Sterling Silver Amazonite Earring 2"
Professional photographers take all jewelry photos. We are very fair and easy to deal with. Faceted Gorgeous Tanzanite Gemstone .925 Sterling Silver Belt Earring 1.8"
925 Sterling Silver Amazonite Earring 1.97"
Russian Amazonite Oxidize 925 sterling silver Handmade Jewelry Earring 1.73"
Main Stone : Amazonite. All our jewelry is 100% natural conflict free. Main Stone Shape : As Seen In Picture. Main Stone Color : Multi Color. Material : Gemstone. Main Stone Creation : Natural. Russian Amazonite Vintage 925 sterling silver Handmade Jewelry Earring 1.22"
Faceted Green Garnet Gemstone .925 Sterling Silver Belt Earring 1.8"
Faceted Multi Tourmaline Gemstone .925 Sterling Silver Belt Earring 2"
Faceted Citrine Topaz Gemstone .925 Sterling Silver Belt Earring 1.8"
Faceted Green Onyx Gemstone .925 Sterling Silver Belt Earring 1.7"
Faceted Swiss Blue Topaz Gemstone .925 Sterling Silver Belt Earring 2"
New ListingRussian Amazonite 925 Sterling Silver Earring 1.50"
Main-Stone : Amazonite. Total-weight-of-Jewelry : 6.9 grams. Faceted Blue Tourmaline Gemstone .925 Sterling Silver Belt Earring 2"
• Design #248 earrings. • Sterling Silver. • Sterling Silver ear wires. Russian Amazonite, Chrome Diopside Oxidize 925 sterling silver Earring 1.58"
Main Stone : Amazonite. Main Stone Shape : As Seen In Picture. Main Stone Color : Multi Color. Occasion : Special Occasion. Material : Gemstone. Main Stone Creation : Natural. Faceted Multi Tourmaline Gemstone .925 Sterling Silver Belt Earring 1.8"
Amazonite Solid 925 Sterling Silver Earring 2.09"
Amazonite 925 Sterling Silver Earring 1.73"
925 Sterling Silver Russian Amazonite Earring 1.73". Professional photographers take all jewelry photos. We are very fair and easy to deal with. 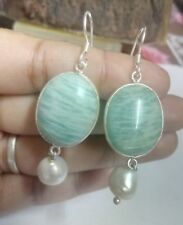 925 Sterling Silver Amazonite Earring 1.73". Professional photographers take all jewelry photos. We are very fair and easy to deal with. New ListingAmazonite Gemstone Handmade Ethnic 925 Sterling Silver Earring 2.0"
Amazonite Hammered Solid 925 Sterling Silver Earring 2.09"
MAINSTONE : Amazonite Rough. MATERIAL : Gemstone. All our jewelry is 100% natural conflict free. OCCASION : Party. 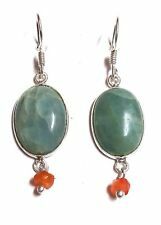 Amazonite, Chrome Diopside Gemstone Handmade 925 Sterling Silver Earring 1.58"
Santa Rosa Turquoise With Blue Tourmaline .925 Sterling Silver Belt Earring 2.1"
Genuine Amazonite cabochons are set in sterling silver in these simple, classic earrings. Latching leverback wires keep them safely in place for you. The gorgeous aqua color is natural and will add a bright splash of color to your outfit. Main Stone : Amazonite. All our jewelry is 100% natural conflict free. (High-quality Jewelry included the handicraft fee! (1) Q: Is this real gold?. A: Yeah,all my item is real gold, we test them before we get them from the factory. Why buy from YX Jewelry?. 1) Professional jewelry designer. We are last 10 years in this field. And a reputed Jewelry Firm in Jaipur (India). We want you to be 100% satisfied with our products and our service. It's Safe and Secure.